Have lots of spent ammo that needs picking up fast and efficiently? 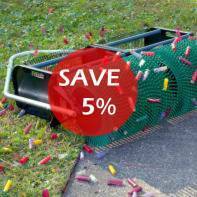 Look no further-- the AmmoUp 36" Pull-Behind Ammo Collector is your solution! Conveniently attaches to your riding lawn mower, ATV or golf cart. As you comfortably drive, the 36" Pull-Behind Ammo Picker Upper collects your ammo via the magic finger technology. The ammo is then discarded into one of the double collection baskets. These baskets are easily lifted and emptied. Imagine the time saved by using this spent ammunition collector! Lightweight yet durable!